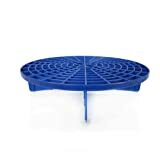 The Grit Guard Insert is a raised radial surface that fits into the bottom of any 3 to 6 gallon bucket. The Grit Guard Insert extracts grit and dirt from your wash mitt, sponge, towel and any other washing utensil when you drag it across the Grit Guard. The dirt settles at the bottom of the bucket so your wash water stays clean. Four quadrants at the base of the Grit Guard calm the wash water and hold the grid above the bottom of the bucket. Dirt and grit fall to the bottom and stay there. The Grit Guard Insert is designed to protect your paint from being scratched - it separates the grit from the mitt. It also prevents swirl marks in your paint which are caused by improper washing. The Grit Guard Insert extracts particles such as dirt, grit and grime for your wash mitt, providing a clean, scratch-free wash mitt every time you go back to the bucket for more water. The Grit Guard Insert is a real paint-saver but also has a number of other uses too. You can use the Grit Guard Insert to clean paint brushes by running the bristles across the grid in a bucket of water or paint thinner. It can be used to clean automotive parts or to drain your oil filter. You can even use the four quadrants as a grid when laying tile. Interested in the Chemical Guys GG-1010B Grit Guard Insert, Blue? Is the price too high? You can easily price watch this product and we'll notify you when the price reaches your target.